For undergraduate and postgraduate students studying composite materials, and researchers, manufactures and end-users of composites. Introduction. Background. 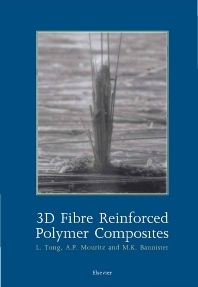 Introduction to 3D FRP composites. Manufacture of 3D Fibre Preforms. Weaving. Braiding. Knitting. Stitching. Preform Consolidation. Liquid moulding techniques. Resin selection. Tooling. Component quality. Micromechanics Models for Mechanical Properties. Fundamentals in micromechanics. Unit cell models for 2D woven composites. Models for 3D woven composites. Unit cell models for braided and knitted composites. 3D Woven Composites. Microstructural properties of 3D woven composites. In-plane mechanical properties of 3D woven composites. Interlaminar fracture properties of 3D woven composites. 3D woven distance fabric composites. Braided Composite Materials. In-plane mechanical properties. Fracture toughness and damage performance. Fatigue performance. Modelling of braided composites. Knitted Composite Materials. In-plane mechanical properties. Interlaminar fracture toughness. Impact performance. Modelling of knitted composites. Stitched Composites. The Stitching process. Mechanical properties of stitched composites. Interlaminar properties of stitched composites. Stitched composite joints. Z-Pinned Composites. Fabrication of Z-pinned composites. Mechanical properties of Z-pinned composites. Delamination resistance and damage tolerance of Z-pinned composites. Z-Pinned sandwich composites. Liyong Tong is a Professor in the School of Aerospace, Mechanical and Mechatronic Engineering at The University of Sydney, Australia. Liyong Tong is widely regarded for his research into composite joints and connections including modelling behaviour, failure analysis and smart structures. Sir Lawrence Wackett Centre for Aerospace Design, Department of Aerospace Engineering, RMIT University, GPO Box 2476V, Melbourne, Victoria 3001, Australia.